The challenge with this project was to create an exceptionally high resolution brushed DC motor controller which also allowed for programmability and a range of potential user interfaces. The customer required high resolution closed loop control for the development of a new turntable. At the outset they were initially looking at using stepper motors but following our proposal it was decided to adopt a precious metal brushed DC motor. This provided a much smoother performance than a stepper with less electrical noise. The precious metal brushes used in this motor also ensure much longer life than typical brushed DC motors. One of the key issues which was identified early on in this project was the exact design of the closed loop system. A typical closed loop system in an industrial application can use a closed loop system which is constantly feeding back to the controller and readjusting as appropriate. However, in an audio application this is obviously potentially very disruptive to the playback quality of an LP with a frequently updating closed loop system creating the equivalent of ‘wow and flutter’ from cassette decks of yesteryear. This is clearly unacceptable. The challenge is therefore one of how set up the closed loop system in a way that it can deliver long lasting and solid performance, whilst at the same time not interfering with playback and becoming a problem in it’s own right. The answer to this is to setup the system in a way that it uses the feedback intelligently and only modifies the speed in such small increments that it is not audibly noticeable. A further challenge with the design of this particular project was to directly interface the controller with an appropriate user interface. Based on this we worked hard to develop a system which could be setup in a variety of ways depending on the customer’s ultimate requirements. Speed changes can be setup though multiple position pots, switches or via an optional user interface (for example LCD screen). In addition, any customer specific requirements could be quickly catered for. One of the things we are most proud of with this particular project is the huge amount of flexibility designed into the controller. By spending time at the development stage of this project and thinking about a range of options that may be required, we have created a controller which will provide a huge range of flexibility for your application. 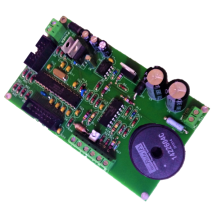 If you are interested in the ZDDC brushed DC motor controller or package please click here. Alternatively, if you would like to request a quote for custom programming the setup then please click here.